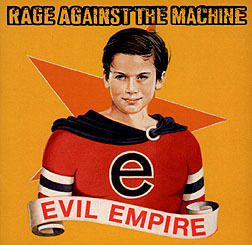 CD Review: Rage Against the Machine, "Evil Empire"
Don't expect anything new from Rage Against the Machine's latest release, Evil Empire. If you loved their last album, you will fall for this one. It's groovin' and funkin', and it retains the raw edge that the band always plays with. This is good club music. It's harsh sound and it's always fun to flail to Rage. I'm not one for politics and war, though, and these seem to be the underlying themes for every song. It's good to be deep and everything, but sometimes I don't get it. The constant hammering of war and crime dulls you after awhile. This really is a one-track-mind disk. Still, I'll say it again: if you liked the last album, you won't be disappointed by this one.